Our curriculum is based upon the development of the whole child. There is a balance of teacher directed and self-selected activities which revolve around a monthly theme or unit. Center time is scheduled to allow for small group activity and re-teaching. Age-appropriate, domain-based activities are planned and implemented daily. Information obtained from children with an IEP/IFSP is taken into consideration when plans are developed and written. Our Lady of Grace Preschool’s curriculum aligns with the Archdiocese of Baltimore and Maryland State Department of Education's standards. Our Lady of Grace Preschool’s PreK2 curriculum is aligned with Maryland's Early Learning Standards and Healthy Beginnings to nurture the potential of each child, for learning across all developmental domains. Our focus is to support and encourage children as they grow and learn. Our early childhood educators utilize critical components of early education such as understanding brain functions, family engagement, the importance of intentional instruction, as well as the intersections between play and learning. Our curriculum is play based, using themes to develop concepts and skills in an age appropriate manner. We utilize Smart Board technology to enhance the learning experience. We explore integrated instruction across all content areas with The Investigator's Club. The Catholic faith is introduced in a simplistic way using Bible stories and religious articles such as the Crucifix, Blessed Mother, Rosary, Advent Calendar and other symbols. Children work together to follow Jesus' example through kindness and patience with one another. Our PreK4 program is directed toward a readiness for kindergarten while learning in a hands-on classroom rooted in the Catholic faith. We explore integrated instruction across all content areas with The Investigator's Club. 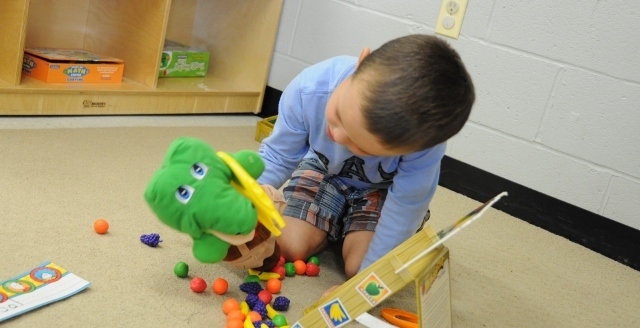 The children explore story elements, alphabet, vocabulary and concepts, and phonemic awareness. Our Math program is based on daily calendar practices, counting, cardinality, numerical operations and Algebraic thinking. Science and Social Studies concepts are taught in hands-on, age-appropriate methods. We utilize Smart Board and iPad technology in support of the curriculum. Our religion curriculum covers the Catholic faith through symbols and articles, Bible stories, and prayer. We study the liturgical events of the Catholic Church and find a love and devotion to Jesus. We share meaningful spiritual lessons and develop a sense of community.